Are BLM Nevada sage grouse efforts in violation of federal law? Home /endangered species/Are BLM Nevada sage grouse efforts in violation of federal law? The Bureau of Land Management this past week issued eight guideline memos instructing federal land managers in 11 Western states as to how they are to carry out policies intended to protect greater sage grouse — a move that threatens to bury ranchers, miners, oil and gas explorers and construction companies under a mountain of paperwork and impose lengthy delays, while doing little to actually protect the birds. The move comes a year after the Interior Department declined to list sage grouse under the Endangered Species Act but instead issued reams of land use restrictions meant to protect the grouse, even though the number of male grouse counted in leks across the West had increased by 63 percent between 2013 and 2015, according to the Western Association of Fish and Wildlife Agencies. Restrictions are being imposed even though sage grouse are legally hunted in many Western states, including Nevada. Like the record of decision on sage grouse management issued this past September, the memos largely ignore one of the biggest threats to the colorfully plumed, ground-dwelling grouse — predators, primarily ravens and coyotes — and address almost entirely human economic endeavors. The 90-page record of decision used the word predator only once. The memos, signed by BLM Deputy Director Steven Ellis, open with statements of purpose that say they are to provide guidance for analyzing and establishing thresholds for land use, with separate memos addressing grazing permits and general surface disturbances. Rep. Rob Bishop, R-Utah, chairman of the House Committee on Natural Resources, immediately fired off a statement denouncing the guidelines as a ploy by the Obama administration to block oil and gas development. “These plans, written as if the sage grouse were listed, are proof it was an underhanded, de facto listing scheme that further oppresses Western states,” Bishop said in a written statement provided to The Associated Press. 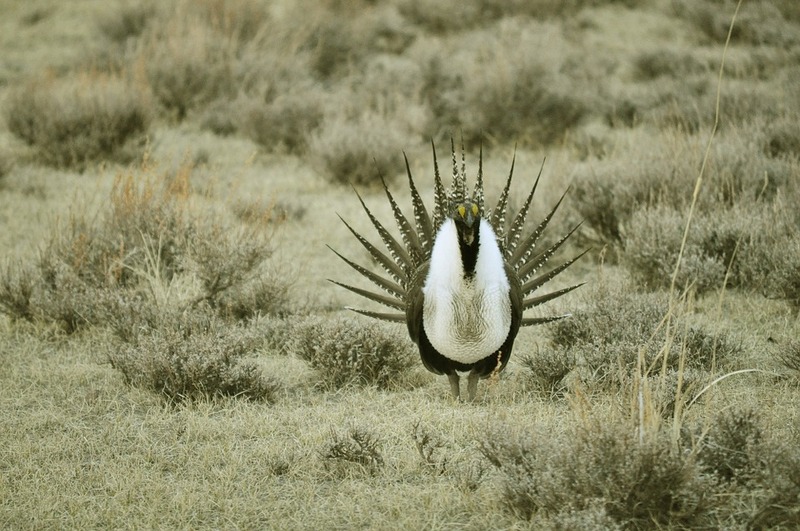 If there is a bright spot in any of this micromanaging from Washington, D.C., bureaucrats, it is that two days prior to the memos being sent out the Interior Department inked a deal with Newmont Mining and its ranching subsidiary to jointly manage sage grouse habitat so the company can continue mining operations and exploration, as well as grazing, in Nevada. Wildlife and natural resource agencies of the state helped broker the deal. A statement from Gov. Brian Sandoval’s office called the agreement a first of its kind in scope and scale. It was not mentioned that Newmont was under considerable duress to cut a deal with federal land agencies, which held all the cards, though Sandoval called the deal a good-faith, public-private partnership. “Through this historic agreement, Newmont has committed to implementing a wide-ranging, landscape-level conservation plan that includes voluntarily managing certain areas of its private rangelands and ranches in Nevada to achieve net conservation gains for sagebrush species,” Sandoval said in a press release. Though the BLM guideline memos envision grazing restrictions to protect grouse, the Newmont deal specifically notes that one of the first pilot projects to be implemented under the agreement will use targeted grazing to reduce cheatgrass, an invasive species that contributes to the frequency and intensity of wildfires. The Newmont deal also makes a vague reference to implementing “practices to reduce human-induced advantages for predators of greater sage-grouse” — presumably fewer fence posts and power line poles from which ravens can scout for nests with eggs. The BLM’s handling of the sage grouse issue remains in active litigation in federal court, where the agency is being sued by Nevada, nine rural counties, two mining companies and a ranch, with Attorney General Adam Laxalt taking the lead, despite Sandoval’s reluctance. Laxalt has stated that the BLM’s grouse efforts blatantly disregard the input of Nevada experts and stakeholders in violation of federal law. The BLM’s own economist has estimated that the grouse habitat conservation efforts will cost Nevada $31 million and 493 jobs annually.